SS Round Pipes, Stainless Steel Round Pipes, SS Round Pipes Manufacturers & Exporters, SS Round Pipes Suppliers. 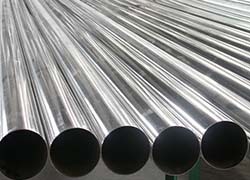 We Royal Steel India, are one of the leading Manufacturer, Exporter & Supplier of SS Round Pipes. We are counted amongst the leading names in the industry, offering an exceptional array of SS Round Pipes that is acclaimed for high quality and durable finishing standards. They are functionally advanced in nature and ensure high compressive strength. Polished Pipe is offered in well-defined time period. Our offered SS Round Pipes is designed under the direction of adept professionals using best quality factor inputs as per the set global norms. To ensure quality assured, it is tested based on various parameters with the help of latest tools & technology. This range can also be availed by clients in various specifications as per their variegated needs.